Germany's plan for 1915 was to stay on the defensive in the west while trying to knock out the Russians, hoping that with Russia out of the war England and France would be more inclined to negotiate a peace favorable to Germany. British plans for 1915 were to strike at what they perceived was the soft underbelly of Turkey. This was their answer to stalemate in France, and they wanted to open the straits to the Black Sea and gain shipping access to their ally, Russia. They also planned for offensives on the Western Front, believing the British public opinion would accept nothing less. 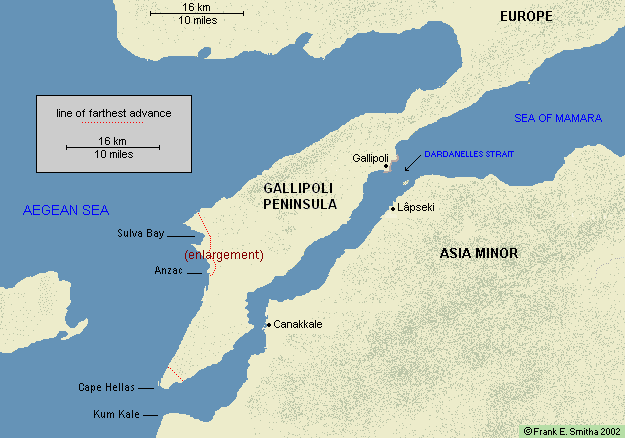 The British and French began bombarding gun positions on the Gallipoli Peninsula in February, and the landing of troops began on April 25 – British troops at Cape Hellas, French at Kum Kale, and New Zealanders and Australians at Anzac. The Turks contained the invasions, and fighting lasted through the summer. A second wave of invaders struck in early August. In September stalemate set in, and in December the Allied forces withdrew. The number of Allies having died in the Gallipoli campaign was approximately 46,000 and wounded were 219,000. On the Western Front, defensive warfare continued to demonstrate its superiority over offensive warfare. The French and British offensives gained little ground. At Neuve Chapelle in early March the British gained a mile and a quarter and suffered 13,000 casualties. A French offensive at St. Mihiel ended after eighteen days of fighting with no meaningful gains and heavy losses in men. In April, against French colonial troops at Ypres, the Germans experimented with chlorine gas – the first major gas attack – which made gaps in the line. The British rushed troops to where the gas attacks had occurred, and they suffered 60,000 more casualties. A French offensive at Artois raged from May 9 to mid-June, the French suffering 100,000 more casualties and the Germans 75,000. On September 25 the British and French tried another offensive. Little was gained and 142,000 more men were lost, the Germans losing 141,000. On the Western Front in 1915 the British suffered about a million casualties, the French about 1.9 million, and the Germans about 612,000, with the battle lines little changed.